Stock #M208:IMMACULATE!!! 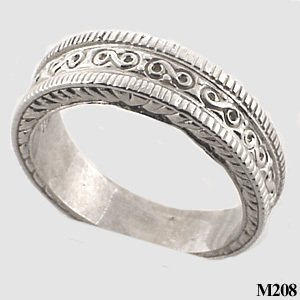 Mens Antique Style Fancy Engraved Wedding Ring......925 Sterling Silver.... 6½ mm wide!!! Gorgeous hand-made piece!!! Beautiful, Heavy, Hand-Crafted, top quality Jewelry workmanship!!! Made to order takes 7-10 days. New style!!! Picture doesnt do justice. Also available in 14k gold! Discontinued! Ths item has sold out and is no longer available in Sterling Silver.